At the Common Knowledge Scholarship Foundation we regularly get emails asking, ‘What is the Festivus Scholarship?” So we will try to explain it and clear up one big misconception. The Festivus Scholarship is a scholarship for, “the rest of us.” The name was selected by interns at the Common Knowledge Scholarship Foundation during a scholarship planning meeting. We had created scholarships for high school students and college students but we still had a large number of parents that wanted to compete and try and win for their kids and others who were out of high school or college for some time but were thinking of going back to school. We couldn’t come up with a category name for scholarships offered for “everyone else” so we borrowed “Festivus” from Seinfeld. Festivus is a scholarship for the “rest of us.” It is a scholarship that has a series of quizzes made up of “general knowledge” questions. Any question that references Seinfeld or Festivus is purely coincidental. Myth 1: The CKSF Festivus Scholarship is all about the TV show Seinfeld. Truth: Only the name is a reference to the Seinfeld show. Myth 2: The Festivus Scholarship winner receives an aluminum pole. Truth: While this would be funny – and it would be true if a CKSF intern won, the winner receives the award listed on the official Festivus information pate. 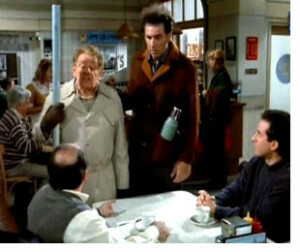 Festivus is a holiday featured in “The Strike” episode of TV show Seinfeld. It originally aired in December 1997. Feats of strength – in which the head of the household must be pinned. This entry was posted by Daryl Hulce on Tuesday, July 28th, 2015 at 10:43 am and is filed under Blog Post. You can follow any responses to this entry through the RSS 2.0 feed. Both comments and pings are currently closed.